At the groundbreaking ceremony for the 12th Avenue Arts building, on a gray day in February 2013, the ground was unavailable for breaking. The Capitol Hill property had been a police precinct parking lot for decades, and the pavement was impervious to ceremonial shovels. But the ritual was enabled by a clever bit of staging: Someone had brought in a large quantity of dirt, piled it on the asphalt and embellished it with glitter. When organizers realized they were one shovel short for the photo opportunity, someone grabbed a black music stand from the band and handed it to the deputy chief of police, who gamely turned it upside down and dug in. Creative problem solving is a hallmark of 12th Avenue Arts, the long-awaited, mixed-use, six-story facility that opens this month. Designed by SMR Architects, the building has large west-facing windows; the apartments are compact but appealing, many with big views of downtown.While not restricted to artists, the 88 units of affordable housing (available to renters earning less than 60 percent of the area median income) are a beacon for artists who’ve felt pushed out of their own neighborhood. (A one-bedroom apartment is $883/month; a two-bedroom unit rents for $1,191.) The building also houses nonprofit and arts offices, ground-floor restaurants (Pel Meni Dumpling Tzar and U:Don noodles) and two performance theaters (one with 149 seats; the other, 80 seats). The Seattle Police Department gets its parking back, too, with 115 secure spots underground. With the Oddfellows object lesson looming large, CHH began collaborating with local arts organizations, businesses, neighborhood associations, Seattle City Council, SPD, then Mayor Mike McGinn and real estate developer Hunters Capital on an affordable housing/arts space combination. In the process, Seiwerath says, “the group heard from the community that there was an urgent need for stable, affordable theater space.” After working two theaters into the design plans, CHH sent out a request for proposals to determine which local theater company would use and manage the space. “When I first heard about 12th Avenue Arts, I was not interested,” says Greg Carter. The artistic director of Strawberry Theater Workshop (“Strawshop”), Carter knew that managing rental space was a full-time job. But then he had an idea, and added fellow indie theater makers New Century Theatre Company and Washington Ensemble Theatre to the application. Under the combined name Black Box Operations, the three groups won the bid. They will rotate use of the theaters for their own plays 60 percent of the year, and rent the spaces to smaller companies the rest of the time. The new performance venues arrived in the nick of time—Seattle Central College, which owns the Erickson Theatre (next door to SIFF Cinema Egyptian), and had been renting it to Strawshop and other nomadic groups, recently decided to reclaim the space for educational purposes. 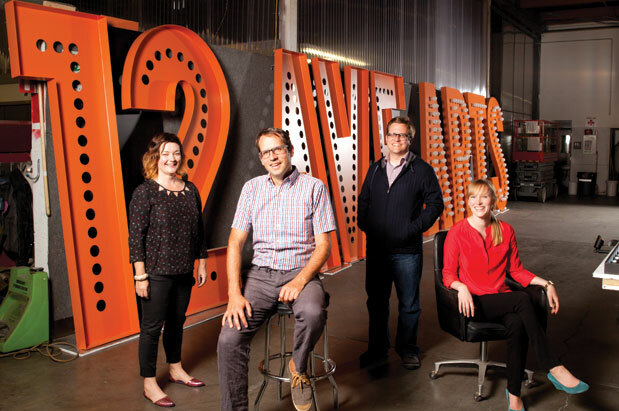 In addition to the steadier (and state-of-the-art) footing 12th Avenue Arts provides, Carter says the space gives the companies the chance to draw new audiences to their performances, thanks in part to the proximity of other respected arts organizations. “In conjunction with Northwest Film Forum, Richard Hugo House and Velocity Dance Center, 12th Ave Arts can centralize great art making on Capitol Hill,” he says. The heady mix of arts groups is one of the reasons that this month, the Office of Arts & Culture will designate the area as the first official Arts & Culture District in Seattle.